The project is the culmination of a year-long technical development by a consortium comprising vehicle education specialist Magtec, the Royal Borough of Greenwich and its urban innovation agency, DG Cities. 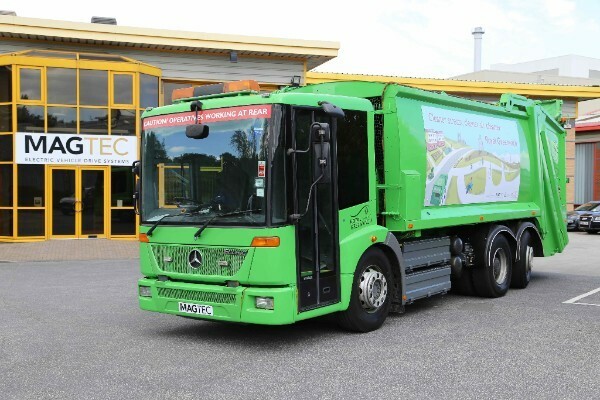 Part-funded by Innovate UK, the project saw the 26-tonne vehicle fitted with an electric drive system that also powers its hydraulic compactor and bin lift, and according to Magtec adds only 400kg to the vehicle’s curb weight, including its power pack, while also improving weight distribution. It is claimed to be nearly silent in operation. Diesel powered refuse lorries operate with their diesel engines in constant use for 14 hours a day, running even while the vehicle is stationary as they also power the hydraulic systems, and achieving typical fuel economy of only 2.5 to 4.5 miles per gallon. Associated air quality issues include emissions of NOx, carbon monoxide, hydrocarbons and sooty particulates, while the noise of their operation is a constant factor in their operation, mainly in residential areas. According to DG Cities, repowering the vehicle represents a lifetime cost saving of up to £300,000 compared to a Euro 5 or older diesel powered model. The project is particularly significant because from next April, central London will become an Ultra Low Emissions Zone, where vehicles entering the area will need to meet emission standards of 80mg CO2 per kilometre face daily charge of £100 for most vehicles over 3.5 tonnes. From October 2020, the standards will apply across Greater London and local authority vehicles will not be exempt. Excellent, both for making a highly polluting truck clean and for giving it extended usage. Next step: all fossil fuel ICEs. I suspect that the whine of the hydraulics and the clatter of the bins and their contents might well drown out the collectors whistling. It will still be a lot quieter than the diesel. It sounds like an all round win.